As those of you who've been following along know, I've been taking part in the A-Z Challenge. 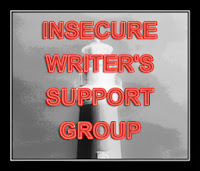 However, I'm also a newish member of the Insecure Writer's Support Group, hosted by Alex J. Cavanaugh. Members of the group post on the first Wednesday of each month. The idea is to post about doubts or concerns you might be having, so that writers in the blogosphere can offer encouragement and support to each other, and hopefully make some new friends in the process. I couldn't really think of a good way to incorporate an IWSG post into my A-Z Challenge theme (speculative fiction tropes). I suppose I could have just broken theme for the day, but dragons are awesome. I couldn't pass up the chance to write about them. So, I thought it would be best to just go ahead and make a separate entry for IWSG. In the spirit of the A-Z Challenge, this entry will still focus on a "D" word. The word, of course, is desperation. I'm very familiar with this word. I have an overnight job that I hate, and every time I walk into the workplace I'm reminded of how desperately I want to be able to make a living as a writer one day. Recently, (thanks to a very supportive girlfriend) I was able to cut my hours down to part-time so I'd be able to focus more on writing. It's been a great help and has done wonders for my productivity, but I still hope to be able to quit for good one day. It took me a long time to be able to tell people I'm a writer when they asked what I did. The lack of any publication credits and the weight of that awful job on my shoulders made it feel like a lie, especially when I was still full-time. It took a few good reads and a few good talks to realize that I am a writer, because I write. It's what I do. My week to week doesn't revolve around the time I spend in that dumb job, it revolves around my writing sessions. Still, the desperation is there. I know it's probably going to be a long, rough journey. Success as an author isn't easy to come by. It takes talent, skill, and lots of hard work (a little luck doesn't hurt either). I think I have some talent, and my skills as a writer improve every day because I'm doing my damnedest to put in as much work as I can. But it still feels hopeless sometimes. Like when the rejections roll in from the fiction markets I've been submitting to, or when my alarm clock goes off on a work night. Like when I'm pulling into the parking lot of that damned place, or when I'm staring at my lunch during break hour. Eventually though, I get to clock out and come home. I get to slide my key into the door and greet Rusty as he shuffles out of bed, tail wagging. I get to wake my girlfriend with a kiss on the cheek to let her know I'm home. I get to wash the filth of the workplace away and have a nice cup of coffee. And then, I get to write. And the desk is patient. It does get hard sometimes, but you have to push through. Sometimes it's good to have a picture, maybe of what you imagine your published book to be or something that inspires you. When you feel down at work you can looks at it and imagine success. I hadn't thought of that before! That's a good idea, Noree. I'll have to try that sometime. It would probably help with some of the misery at work, haha. I feel for you acutely. I have similar nights, when I set my alarm and think "Can I just quit and do what I really want to do?" I've got to say though - you really have something going for you. In my book, (seriously, no pun, intended <.< >.>) it takes real guff to tell people your a writer - especially when you aren't where you want to be. Sometimes I want to gag my husband when he starts to mention it to someone. While, I'm hugely blessed not to suffer serious insecurities about my writing too often, I'm a terrible closet writer. I salute you for sticking to your guff! You ARE a writer! The obvious conviction you have will definitely get you where you're going. Once I realized I didn't have to wait for the first paycheck to come in to treat this like it was my profession, my confidence and self-esteem as a writer improved dramatically, which only made me more productive. Self-identifying as a writer was an important step for me, and I recommend it as the first step any aspiring author should take. This is a very encouraging post. You know why? Because you're living proof of what it means to be a real writer. You have to work a job you hate, so you can afford to write even when it doesn't bring you money---because you love it. You have pangs of insecurity and self doubt that would make any weaker person quit, but you keep writing every day---because it's in your blood. And most of all, you're open about your desperation because somewhere deep inside you know that it won't affect your will to write, that you're a writer on bad as well as on good days. This is why this post is motivational. It shows that if you really want to write, if that is who you really are on a fundamental level, nothing that stands in the way will change that. It makes it harder, that's true, but hardship only polishes your will, and without some opposition there's no feeling of success. I'm so glad you found my confessional encouraging, Vero. I think that was another thing that helped me in my earliest and strongest moments of doubt, connecting with other writers for the first time and realizing that everyone has these doubts and fears. Everyone feels the weight of "real life" on their shoulders when pursuing a dream. But you're right--it's how we respond to those moments that matter. I think your D should also stand for Determination, because that's what I saw when I read your post. Keep faith in yourself and keep writing! Thank you, Paula! I appreciate the words of encouragement. I understand exactly what you mean about being embarrassed to say you're a writer. I'm in the same boat. I'm a full-time writer but am yet to earn a penny from it (In fact, thus far it has cost me, what with editing and courses etc) But although it still makes me cringe inside, I decided recently to tell anyone who asks that I'm a writer. Fake it until I make it. And don't doubt your writing. You have a wonderful style and a good voice. It comes through in your blog. Go for it. Becoming a professional is more about developing a professional attitude than when your first check comes! So you're doing the right thing by telling others what you do. But don't tell yourself you're faking it. If you write, you're a writer. Nothing fake about that! Thanks so much for the compliment, Gwynneth! Good luck to you! Hey J.W. :) As a fellow part-timer at a job I'd rather switch in for full-time writing, I totally get ya. Great post! Oh, and I agree with Paula ^ about D for Determination. It takes nerve to go after a passion, especially one as easily swayed by chance as publication. But you're doing it. Good for you! Thanks! You and Paula are right, determination and desperation go hand-in-hand, usually out of necessity. I'm hanging in there. Hopefully one day the both of us will be writing for a living! Good luck to you, A.M. I know that feeling, Vikki! But not being published yet is nothing to be embarrassed about admitting. Everyone starts somewhere. When I get that question, I just say "stay tuned." So if you were to ask my advice (not that you did, *wink*), I'd say let that go if you can and proudly proclaim yourself a writer. It's nice to hear your own voice say it! Paychecks don't make you a writer, writing makes you a writer. Thanks for stopping by, Vikki!